There’s something about pastels that always makes me feel younger – the playful, soft colors would make anyone feel more feminine. 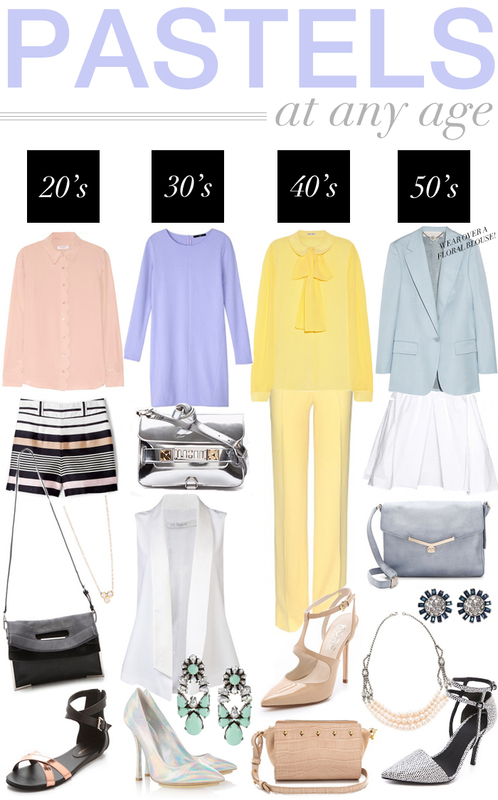 Pastels can be both exciting and subdued, which makes them easy to wear at any age. The younger looks play up the shades with fun accessories, while the ensembles for the 40/50 age group focus on accessories that downplay the look for an elegant twist. PS – does anyone else love the monochromatic/all-one-color look? Such a chic trend! I’m currently on a path to do that with red. So obsessed! All so gorge! Great picks! I especially love the vest and PS bag. we’re totally on the same page – white and metallic are so hot together! Absolutely love the 20’s outfit — possibly because that’s the category I fall into! Also love both earrings on the board, and the shoes from the 50’s! Makes me want spring! Yeah, my faves are the 20’s and 30’s – definitely more fun! That yellow blouse is to die for! I love monochromatic dressing…very editorial! I also adore the monochromatic look. It’s so chic when done right! Ha! love all four ensembles and would wear them all even if I wasn’t in the proper age bracket. Such great combinations! AH! I love that Tibi dress! SO cute! I love each one of these! I hope when I’m 50 I’m chic enough to wear that look. I’d even wear it now, and I’m in my 20s! Oh, and I agree with you: the monochromatic look is so chic, especially in red! You should make that a post next week with your new red YSL bag! That’d be killer. I’m in my twenties but the 30s look is definitely my favorite :) Love a simple dress like that! This round-up is so good, lady! Love the pieces you’ve picked here!